Improve digestion: Carrots are high in dietary fiber, a key component of good digestive health. Fiber protects the digestive organs from serious illnesses and improves heart health by helping eliminate LDL (“bad”) cholesterol from arteries. Boost dental health: Surprisingly, carrots are natural abrasives that help remove plaque from teeth and gums. They also stimulate the production of saliva, which helps prevent food from lodging in and on your teeth. 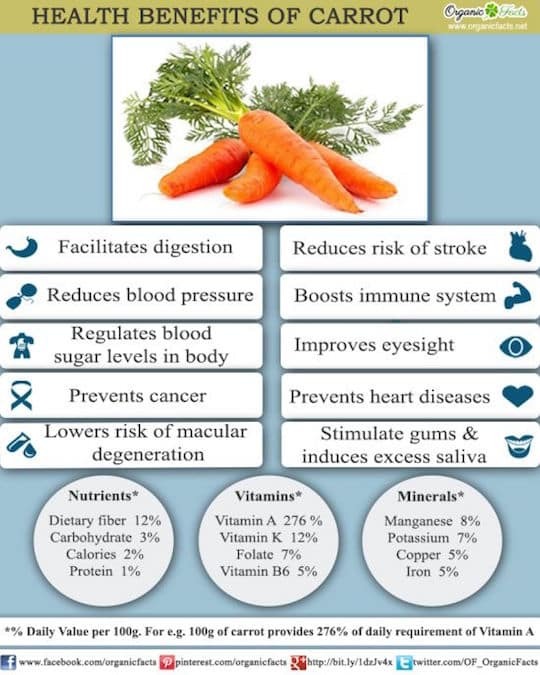 The minerals contained in carrots also help to eliminate germs in the mouth that can lead to dental damage. Nourish the skin: Carrots contain substances that cleanse the liver; that, along with the beta-carotene, make way for healthier skin. Carrot is also useful for treating uneven skin tones due to pigmentation. The high vitamin A content and other vitamins, minerals, and antioxidants lead to a more glowing complexion and fewer blemishes. 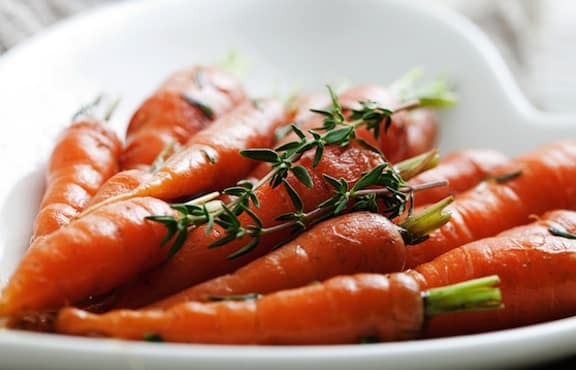 Fight aging: Carrots’ high beta-carotene content, along with other antioxidants help fight free radicals that lead to breakdown and aging of cells. Regulate blood sugar: Carotenoids are a substance in carrots that counteract insulin resistance normalize blood sugar. They’re a good food for those trying to improve diabetes or borderline high blood sugar, as they help stabilize insulin and glucose metabolization. Aside from snacking on carrots or using them in your salads, explore VegKitchen’s Top 10 Carrot Recipes for tasty ideas.